Description: The social and intellectual vitality of Judaism and Christianity in antiquity was in large part a function of their ability to articulate a viably transcendent hope for the human condition. Narratives of Paradise - based on the concrete symbol of the Garden of Delights - came to play a central role for Jews, Christians, and eventually Muslims too. These collected essays highlight the multiple hermeneutical perspectives on biblical Paradise from Second Temple Judaism and Christian origins to the systematic expositions of Augustine and rabbinic literature. They show that while early Christian and Jewish sources draw on texts from the same Bible, their perceptions of Paradise often reflect the highly different structures of the two sister religions. Dealing with a wide variety of texts, these essays explore major themes such as the allegorical and literal interpretations of Paradise, the tension between heaven and earth, and Paradise's physical location in space and time. 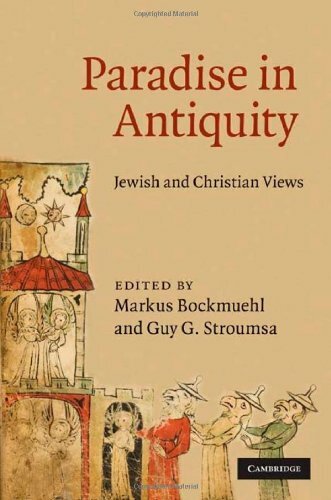 Citation: Pieter G. R. de Villiers, review of Markus Bockmuehl and Guy G. Stroumsa, eds., Paradise in Antiquity: Jewish and Christian Views, Review of Biblical Literature [http://www.bookreviews.org] (2015).